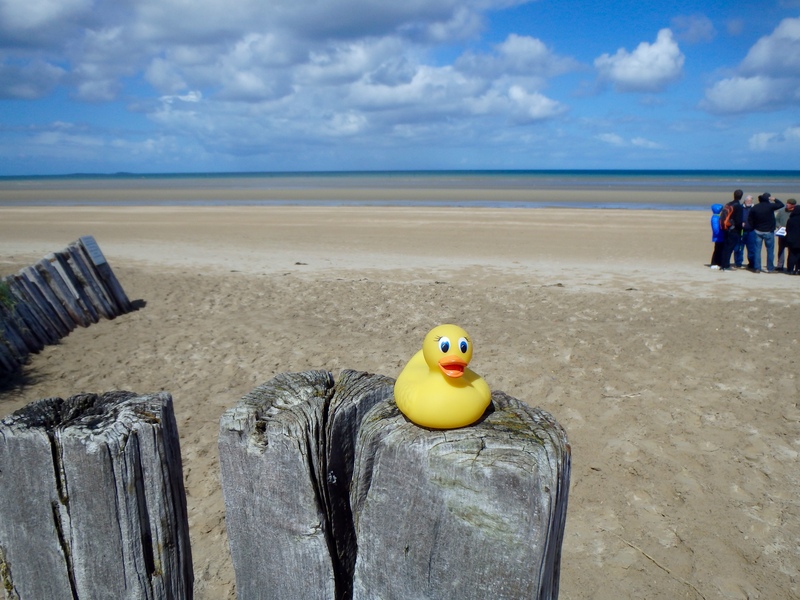 Ms. Ducky, like many Americans, wanted to visit Normandy to see where many of our ancestors fought to help Europe end World War II. She and her humans are taking the train to Normandy. 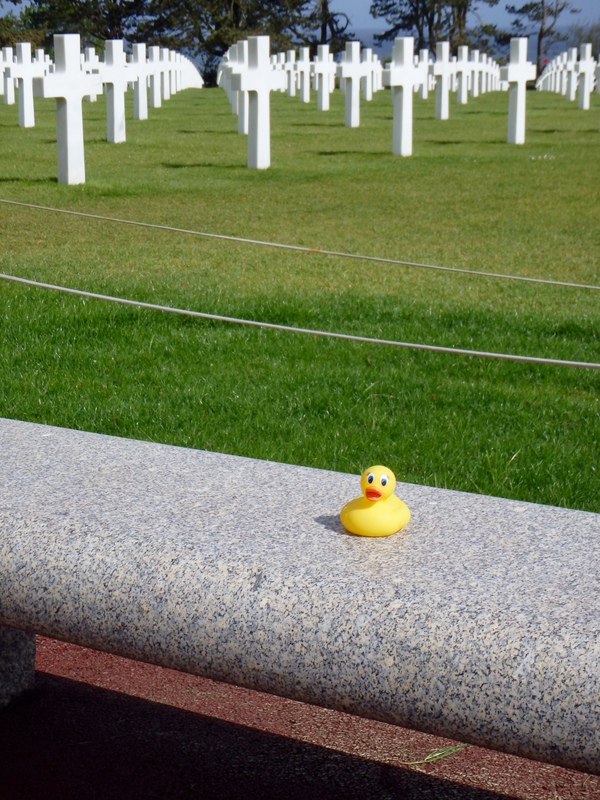 She stops at the American Cemetery to pay her respects to her relatives and so many others. This is a view of the famous Omaha Beach. So much happened here 70 years ago. 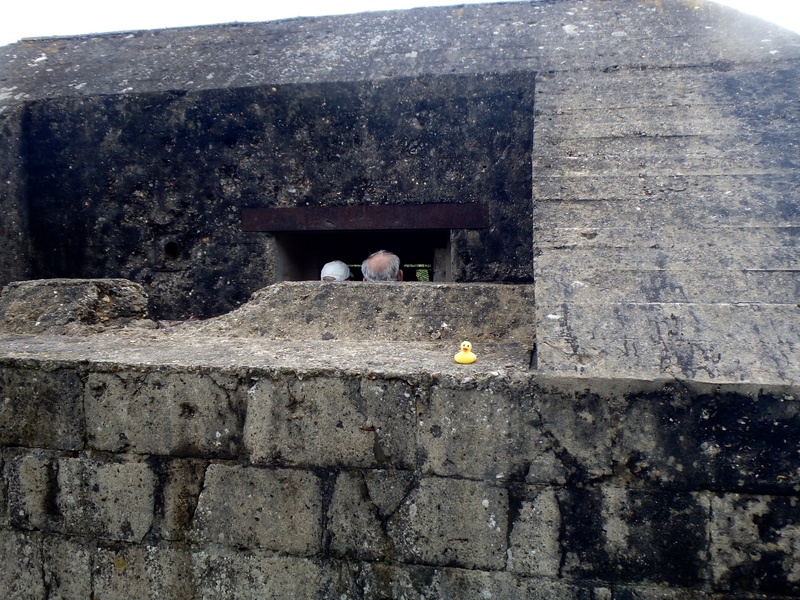 Ms. Ducky and her humans visited this German Bunker. 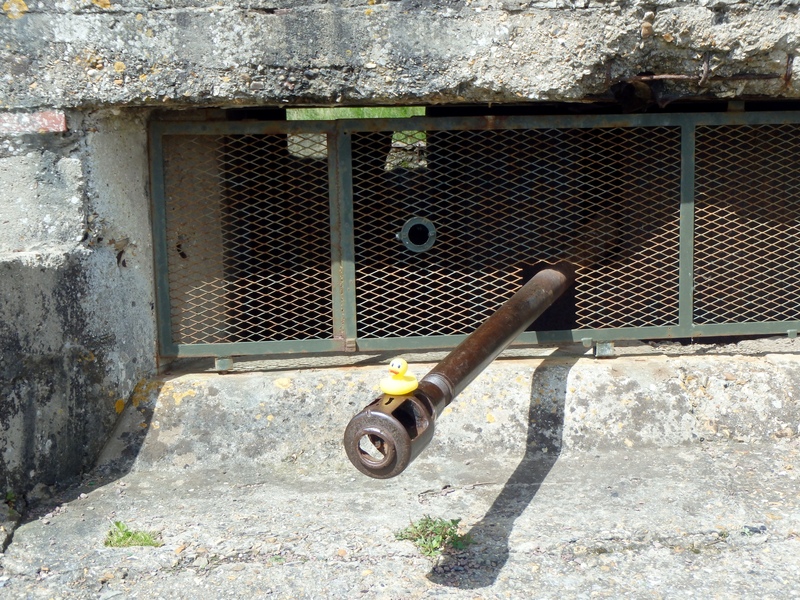 Guns were mounted here on the bunker during World War II. 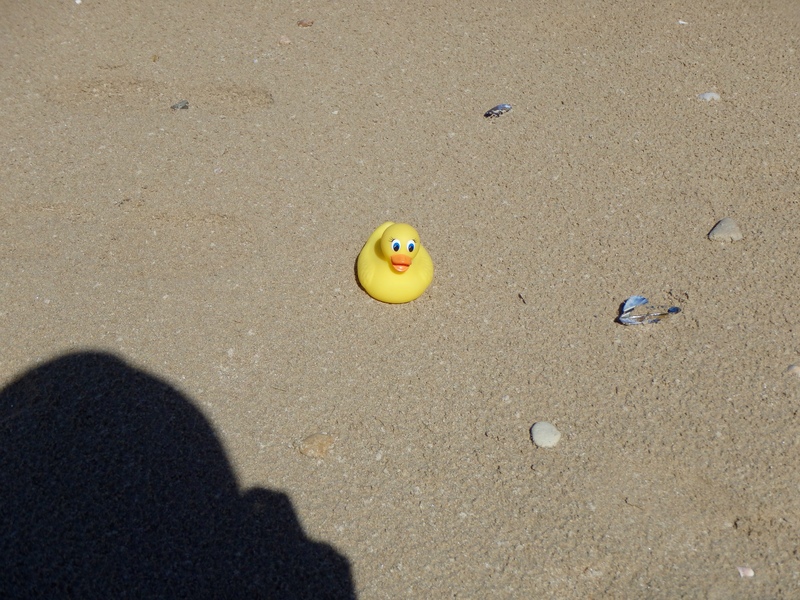 Ms. Ducky is on the sand of Utah Beach. 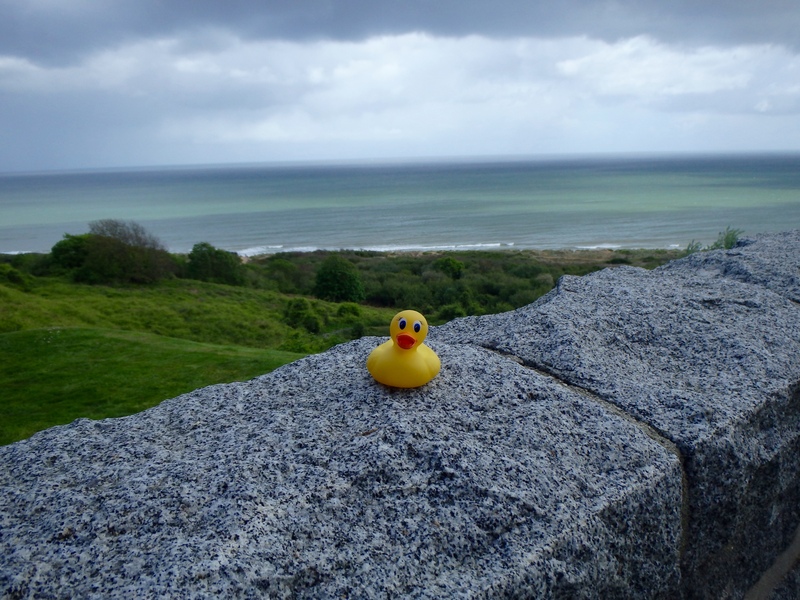 She wanted to sit higher so she could get a better view of Utah Beach in Normandy, France. She liked the memorial to all the troops from so many nations. 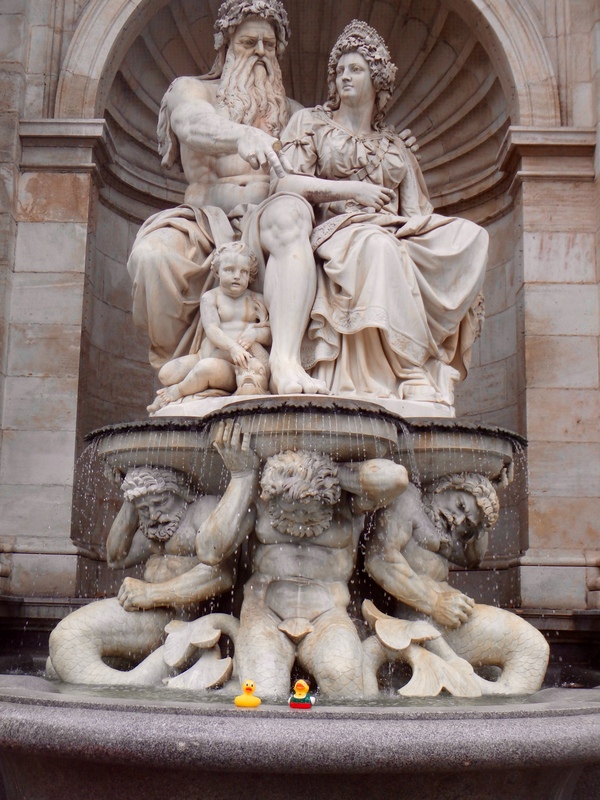 Ms. Ducky said this was a serious end to her European vacation. 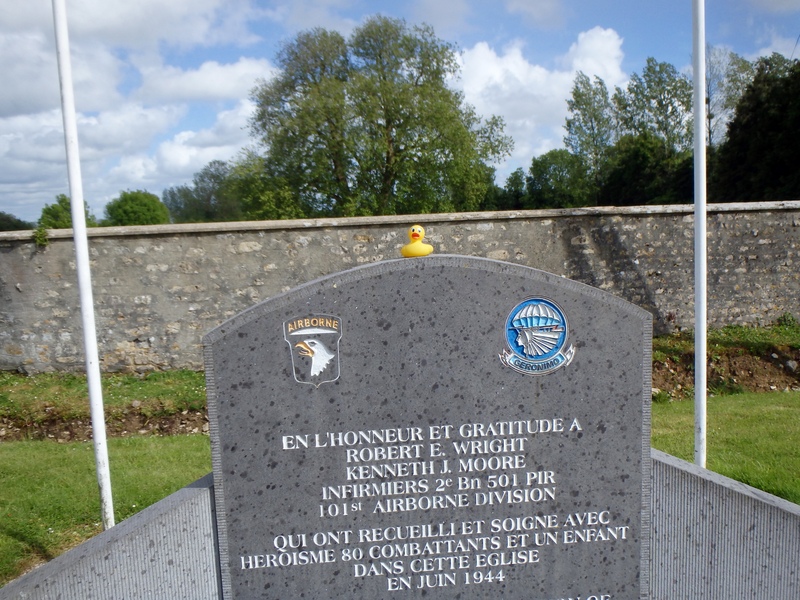 She was glad to visit Normandy and see where freedom was won. She really appreciates and thanks everyone for the effort and sacrifice. 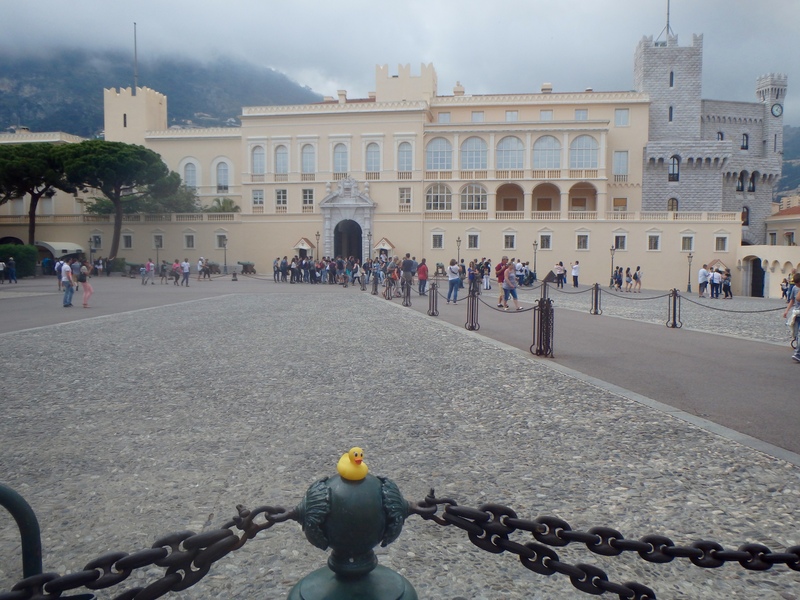 Europe is now a wonderful place to visit and Ms. Ducky and her humans had a fabulous vacation. 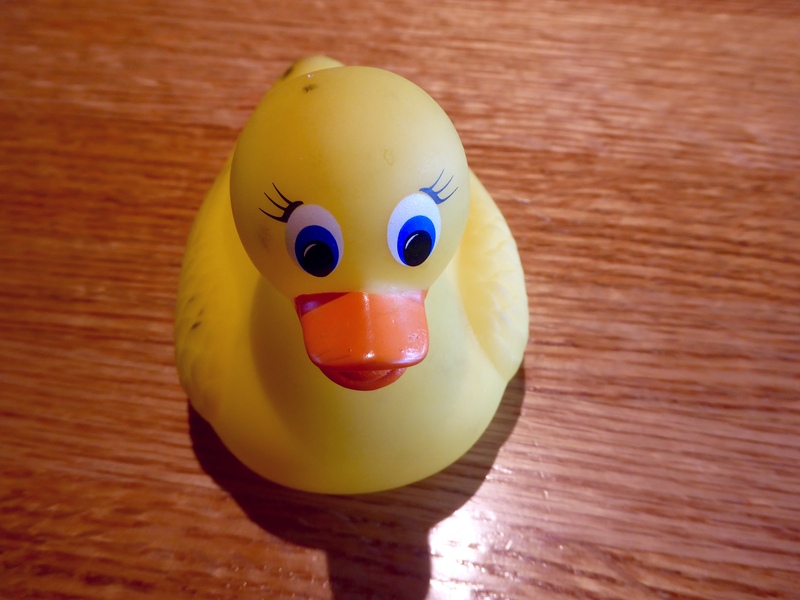 Remember that Ms. Ducky is a very friendly duck. 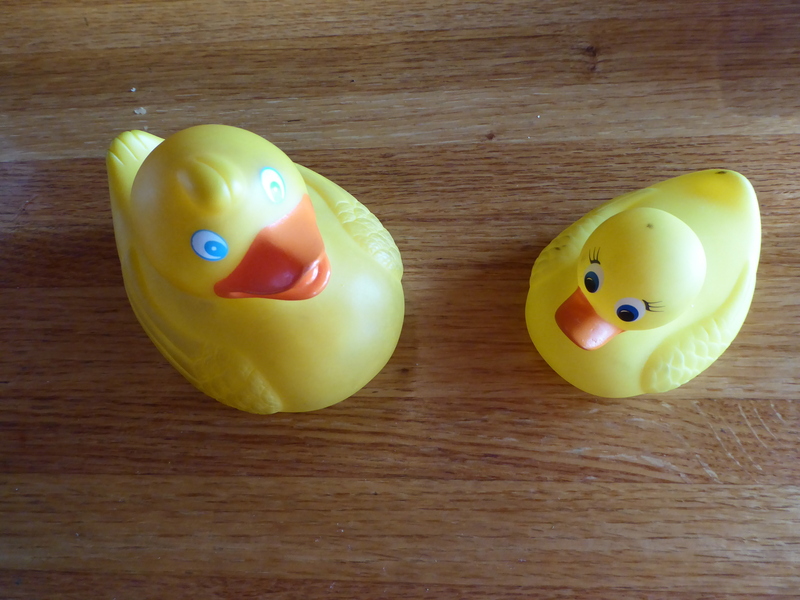 She is bringing some European duck friends to Colorado. 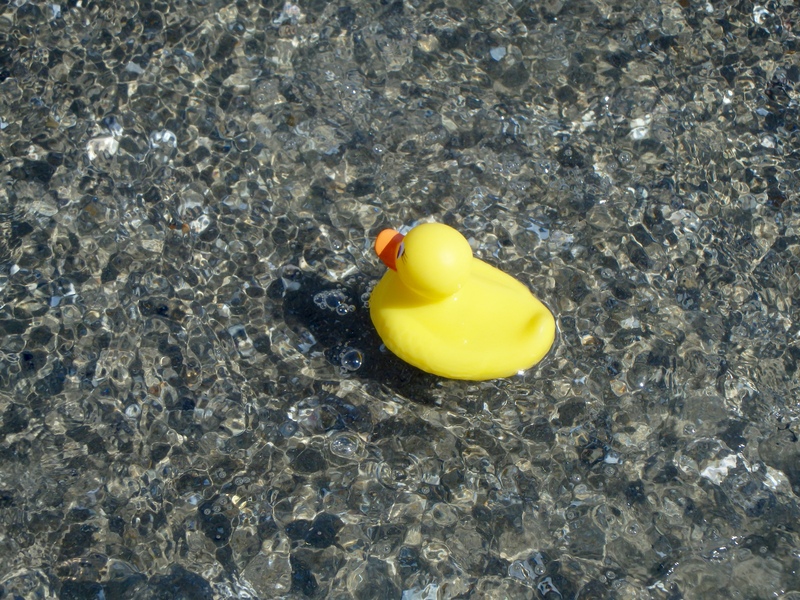 Great Ms. Ducky. We know we will like all your new friends. She hopes you all visit Europe soon. 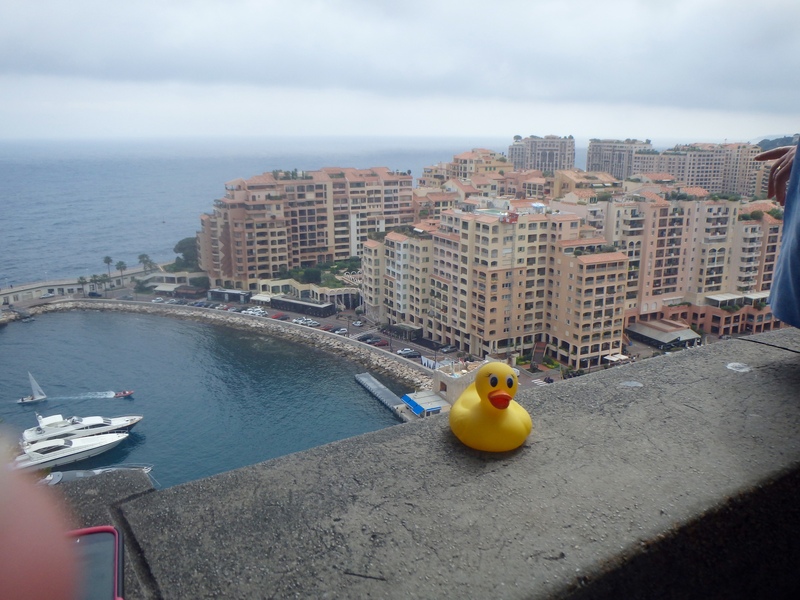 Ms. Ducky says she will visit Ireland soon. Wow! We want to hear about that trip, too. 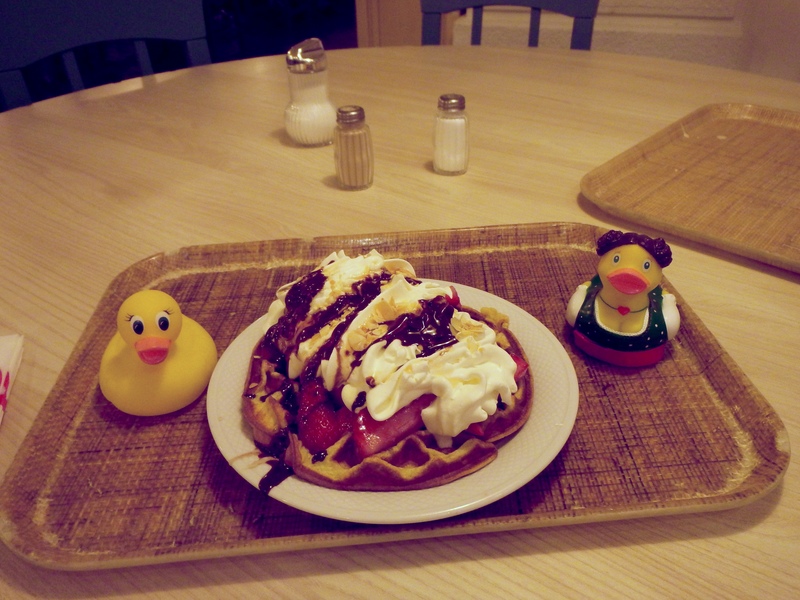 Thank you, Ms. Ducky, for sharing your vacation with the Colorado Traveling Ducks. 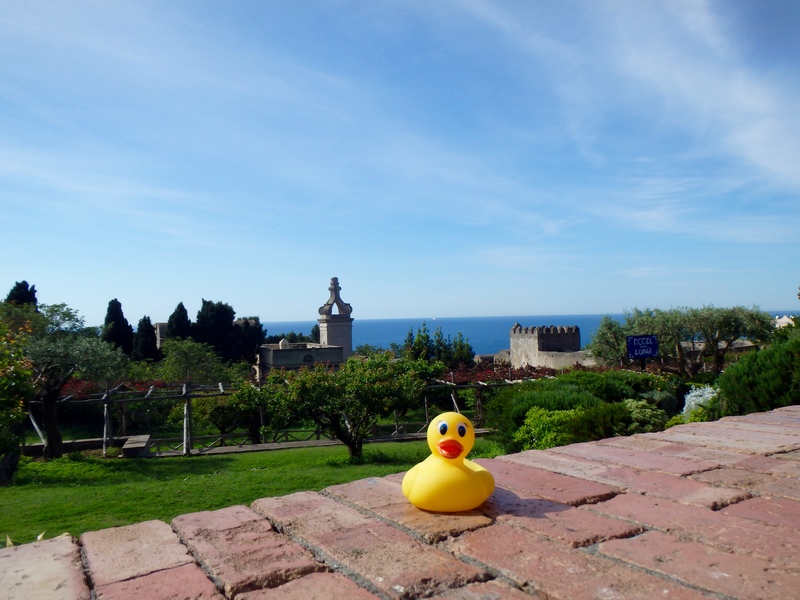 Ms. Ducky, our friend, continues traveling through Italy. 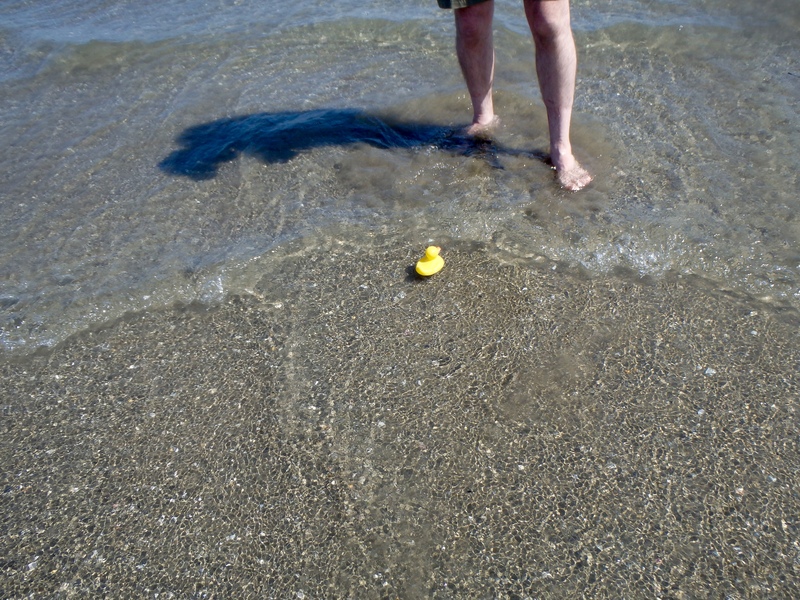 I, Ms. Ducky, decided to visit the Adriatic Sea and test the waters. Here I am, on the beach. Here is some really clear water. I am on the Isle of Capri, now. 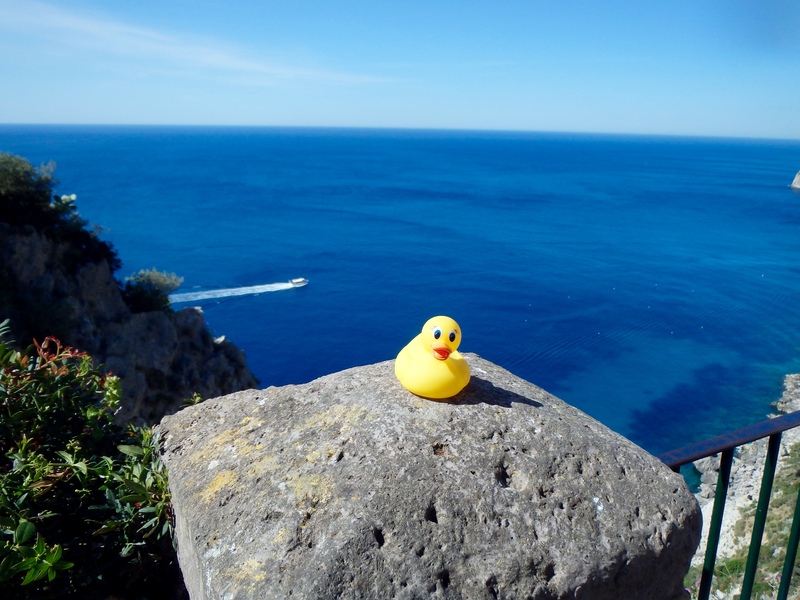 This a rocky island, but look at the view of the Mediterranean Sea. This water is so blue. I love it. The houses really are on the side of the cliffs here. 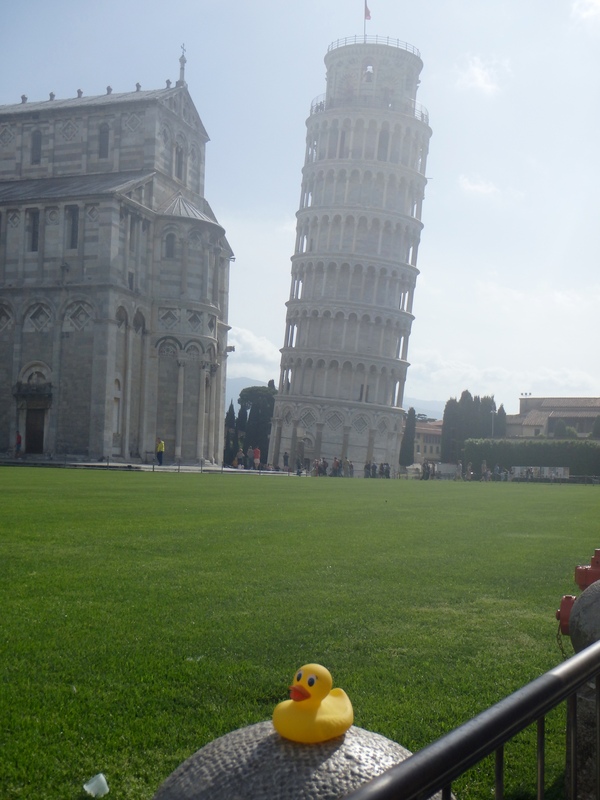 The Leaning Tower of Pisa really is leaning. And, it is not falling down. Don’t you think I need something big? And, of course, yellow to match me. How about this for a shock. 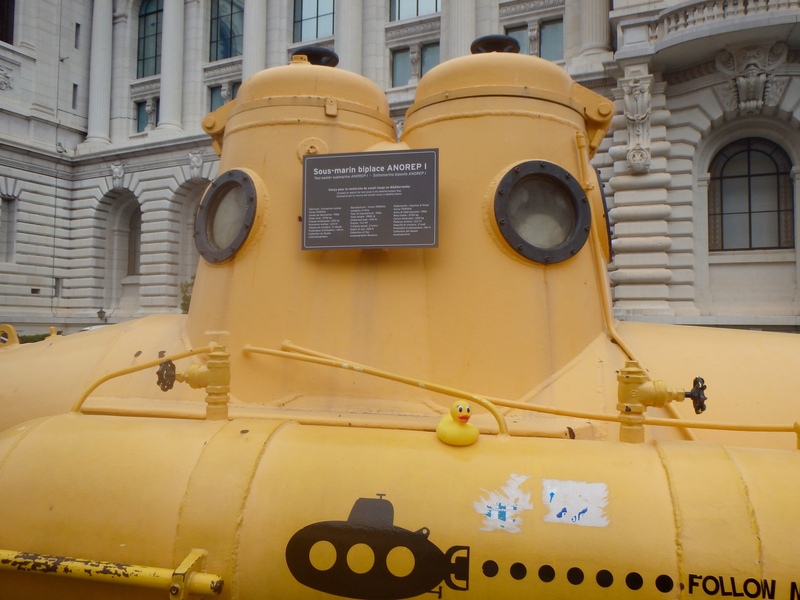 A yellow submarine. 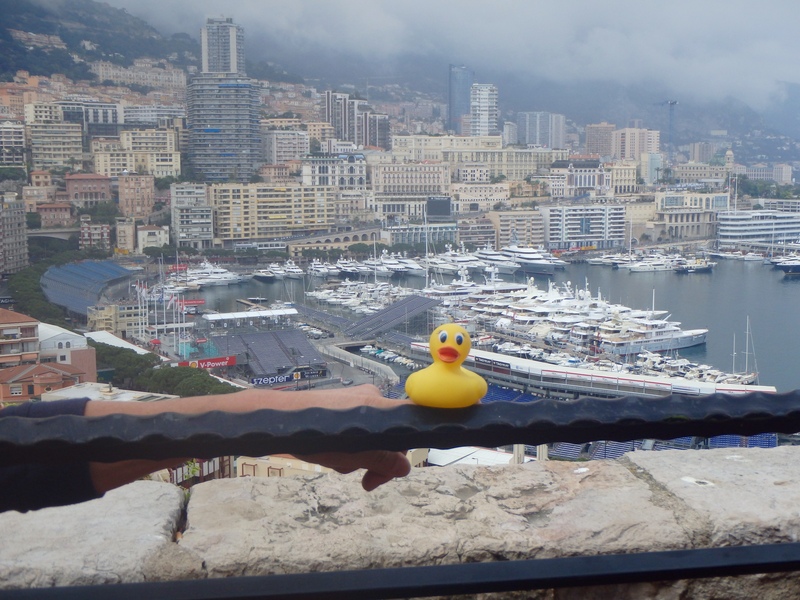 Now I, Ms. Ducky, am off to Monaco. Here is the Royal Palace. Very nice place. 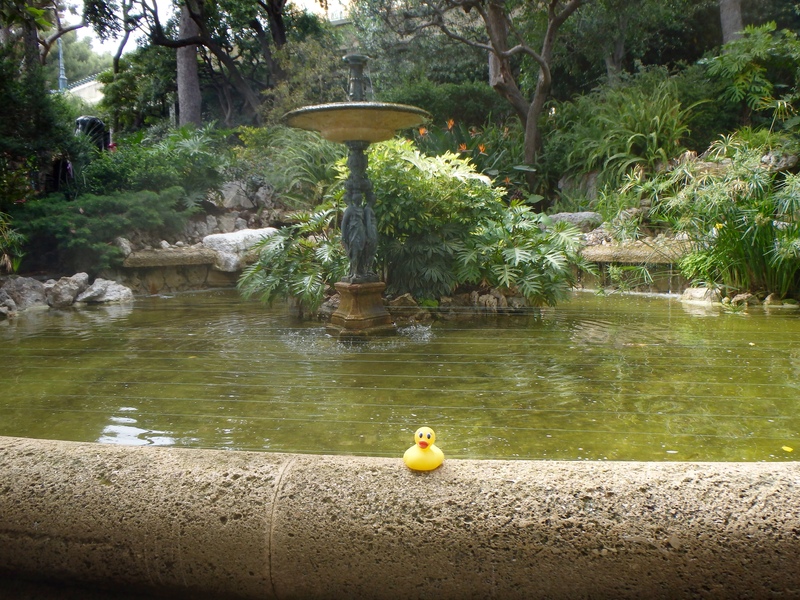 There are many beautiful fountains here. The yachts of the rich and famous are very attractive. Monaco is a very pretty country. No photos, but we did ride on the Grand Prix race track. 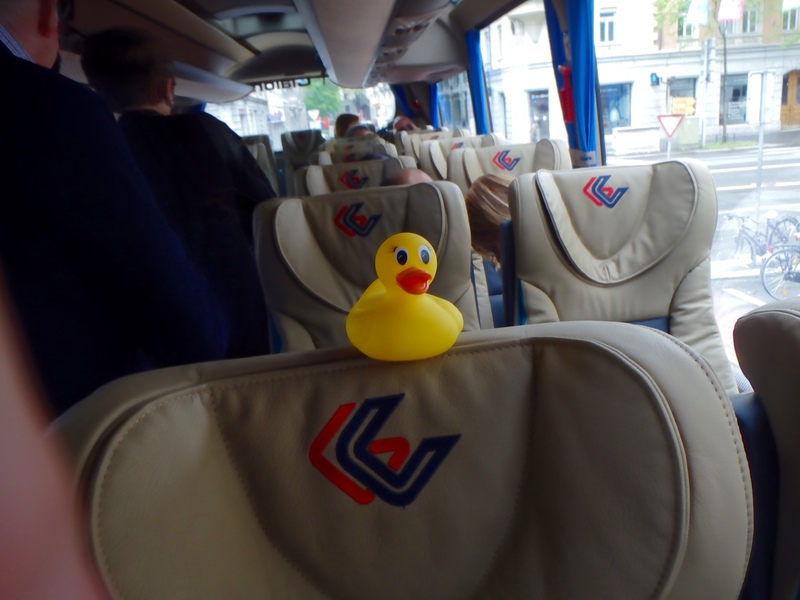 I am having a great time touring Europe. And, I am not done yet. 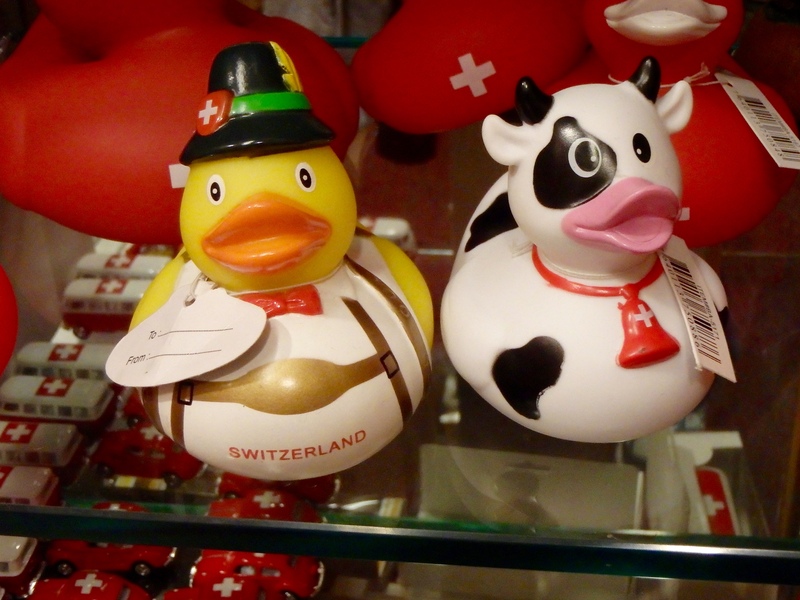 Our friend, Ms. Ducky will tell us about her time in Switzerland today. As you know Zeb, I, Ms. 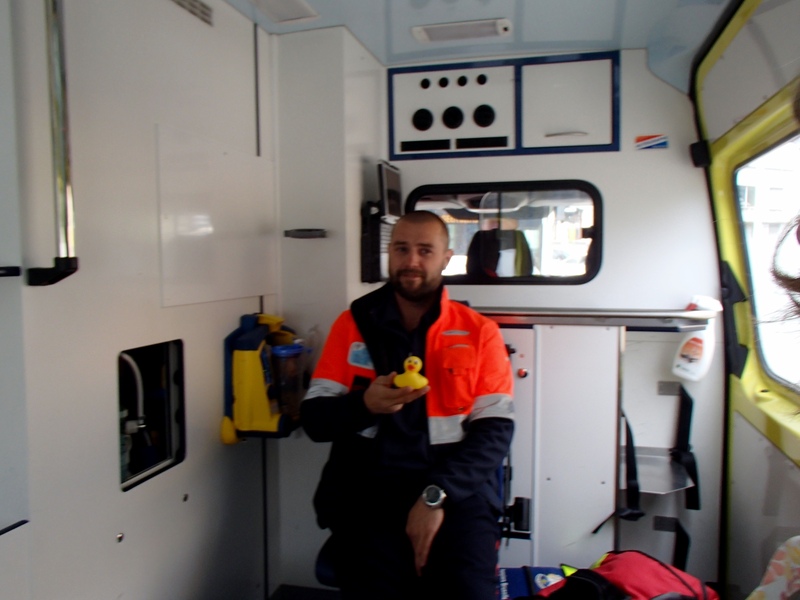 Duck, am very friendly. Here I am with a new friend. You will notice that we are near the beverage mugs. 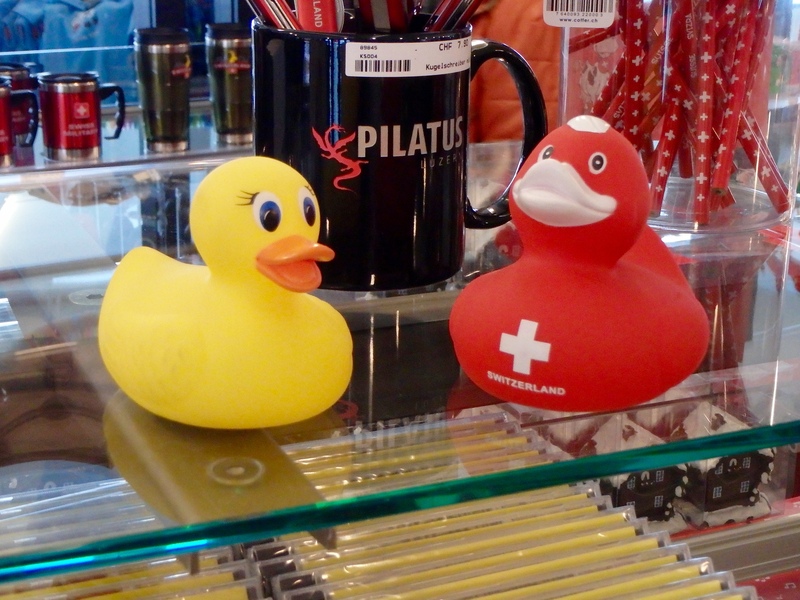 These are some other new Swiss friends. Aren’t they adorable? 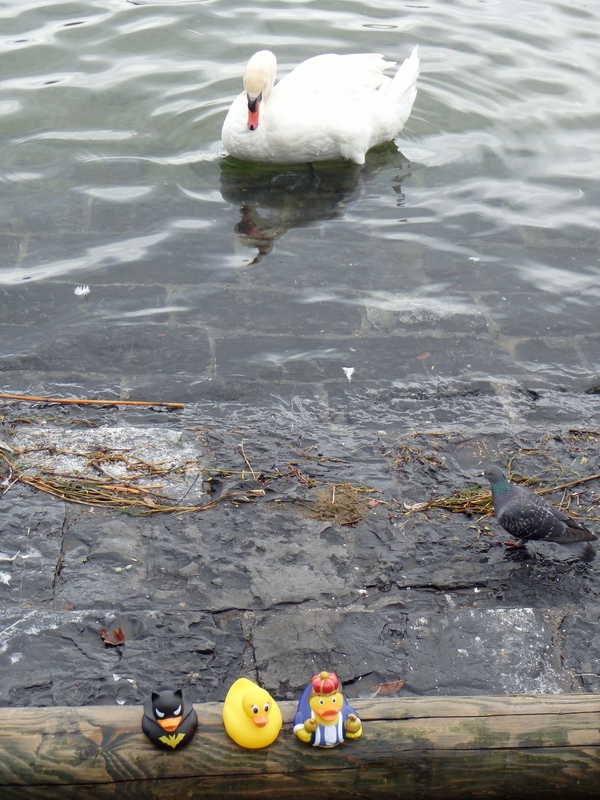 I believe this white swan, swimming on Lake Lucerne want to visit with us for a while, but she was a little shy. 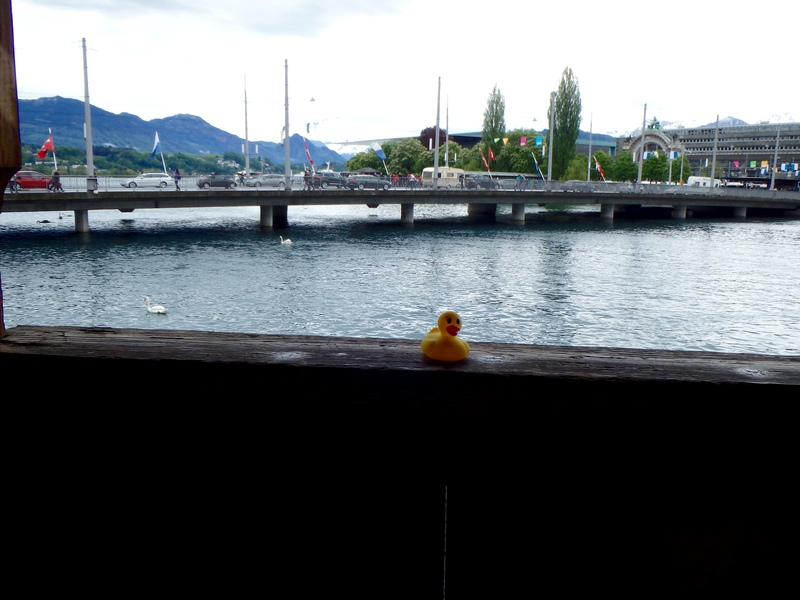 Nice bridge here in Lucerne, also. 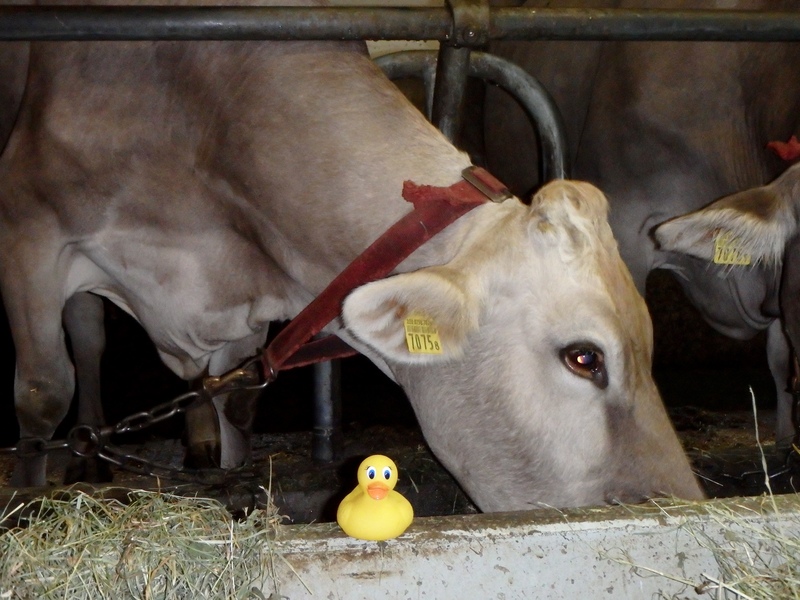 Our tour bus took us to a farm in Switzerland. We took a carriage ride here. It was so much fun! Later I made more friends. Love her glasses. This guy appears ready for anything. 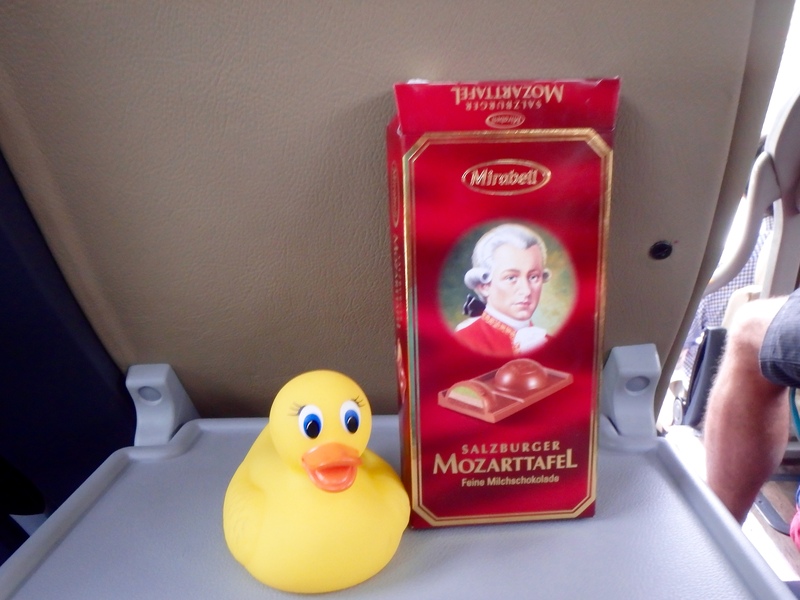 Of course, European chocolates are also popular with ducks. 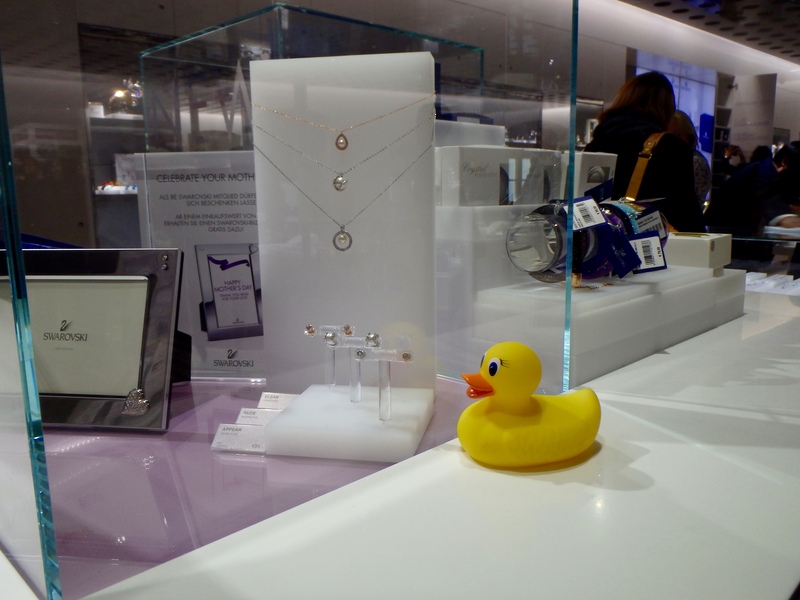 No trip to Europe would be complete without a visit to Swarovski. Lots of pretty stuff here. Europe has great shopping. So many ornaments. Beautiful presentation of this meal. 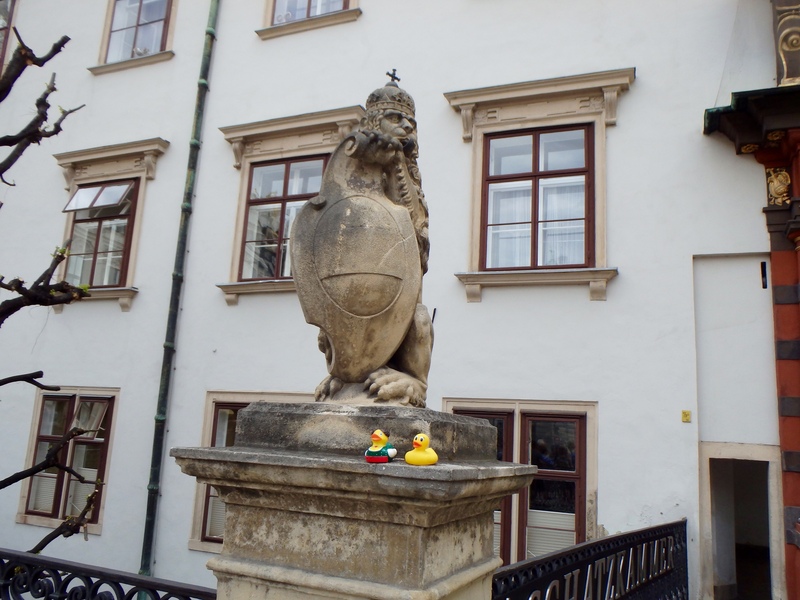 The statues in Europe are very ornate and very old. This one is great. But not all statues are old and stone or marble. 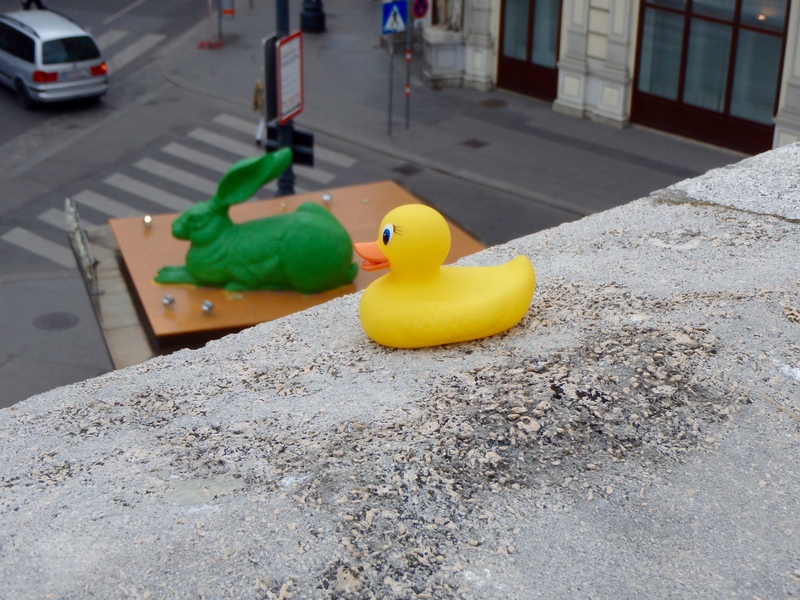 I really like this big green rabbit. Adds great color to the city. 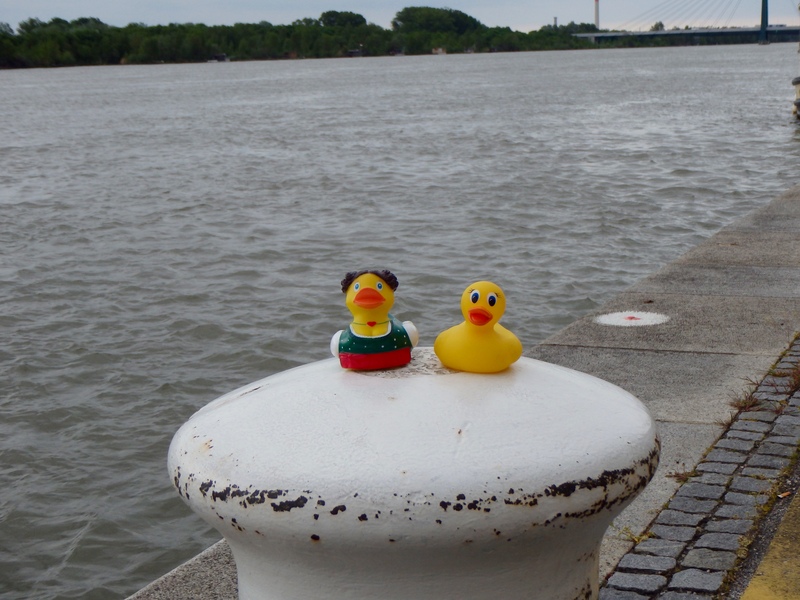 In Vienna, my friend and I felt so European, sitting here by the Danube River. 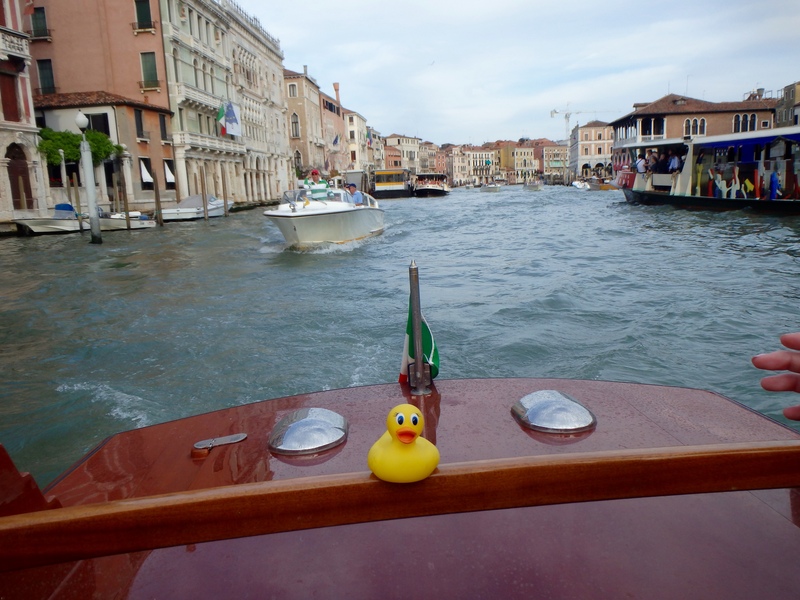 I loved the canals of Venice. 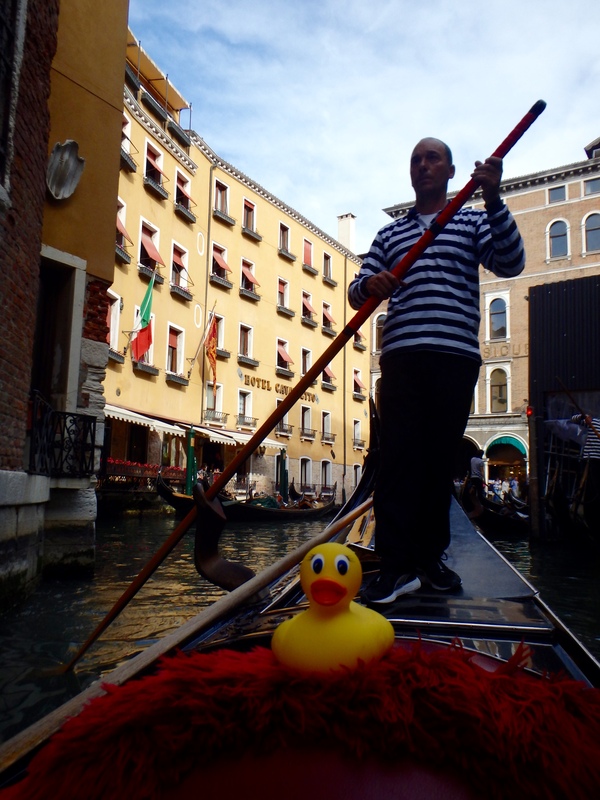 And the gondola. . .This man can help us float through Venice. Just perfect. I really like these water taxis, also. Remember, I live in Colorado and I love it, but we don’t have this much water. Venice is wonderful. 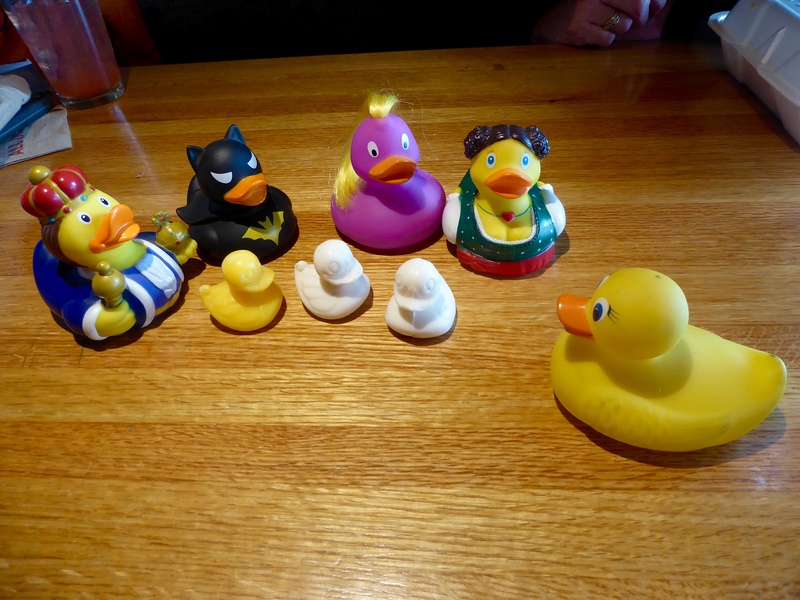 Thanks, Ms. Ducky, for sharing this with The Colorado Traveling Ducks. 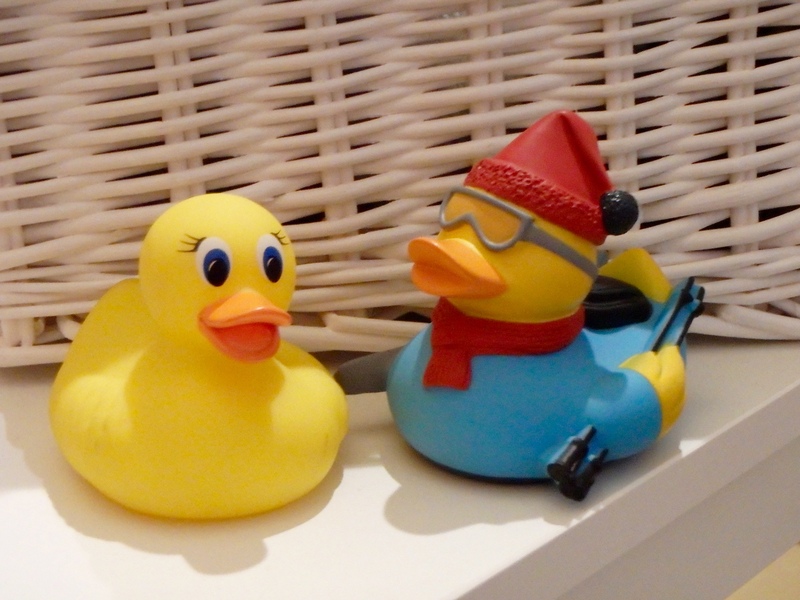 I, Zeb the Duck, want you to meet my friend, Ms. Ducky. 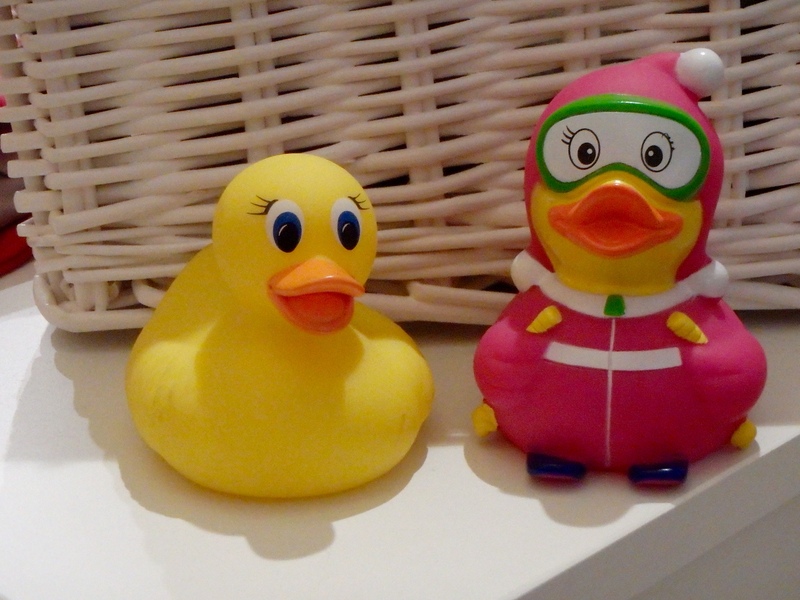 Her mom and my mom are friends, so Ms. Ducky and I, Zeb the Duck, are also friends. 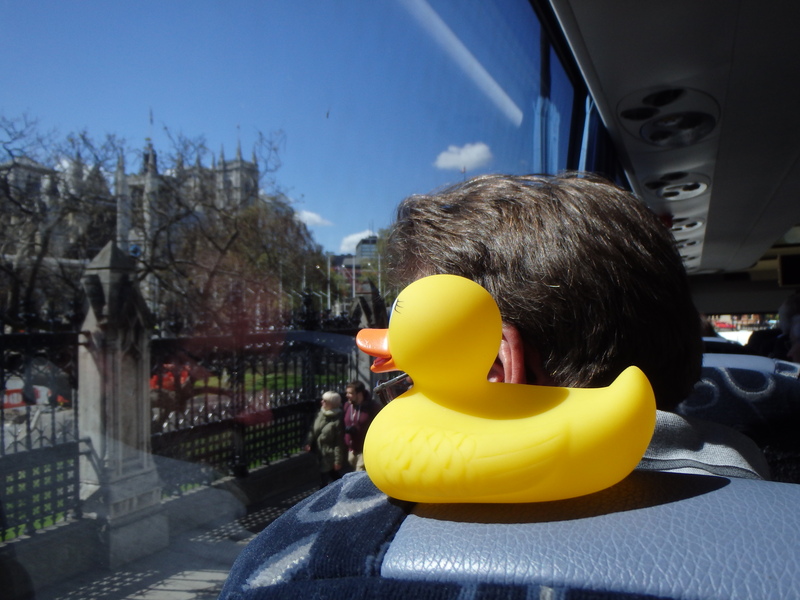 Ms. Ducky and her humans flew to London, England and began sightseeing immediately. She is seeing so many new and interesting things. She visits the American Embassy and admires this statue. She is sitting at the feet of General Dwight D. Eisenhower. 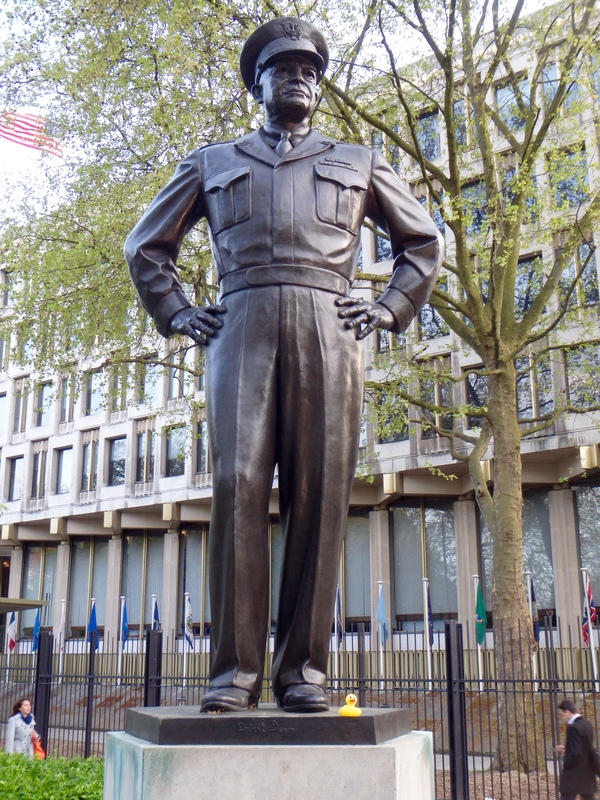 He was a very important American Army General during World War II, and later General Eisenhower was elected President of the United States, twice. This is an exciting place at the London train station. 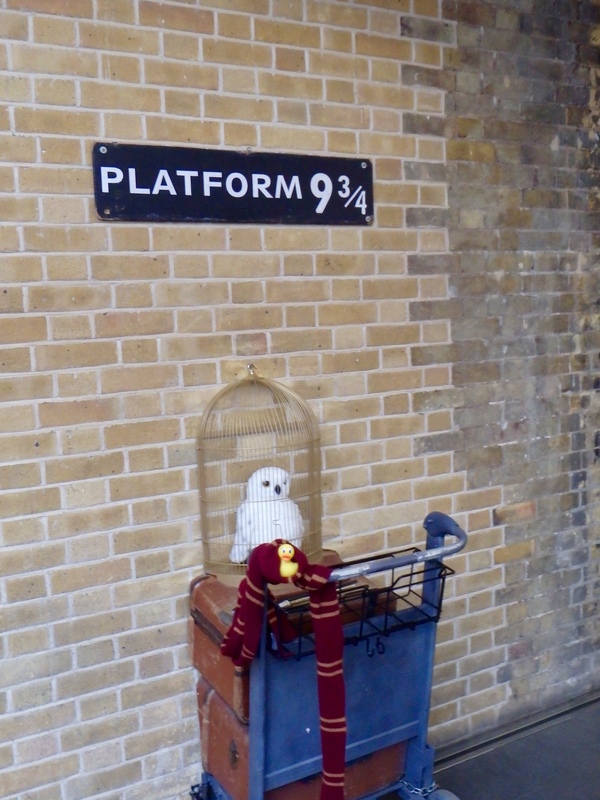 This is Platform 9 3/4. Platform 9 3/4 is very important to Harry Potter. 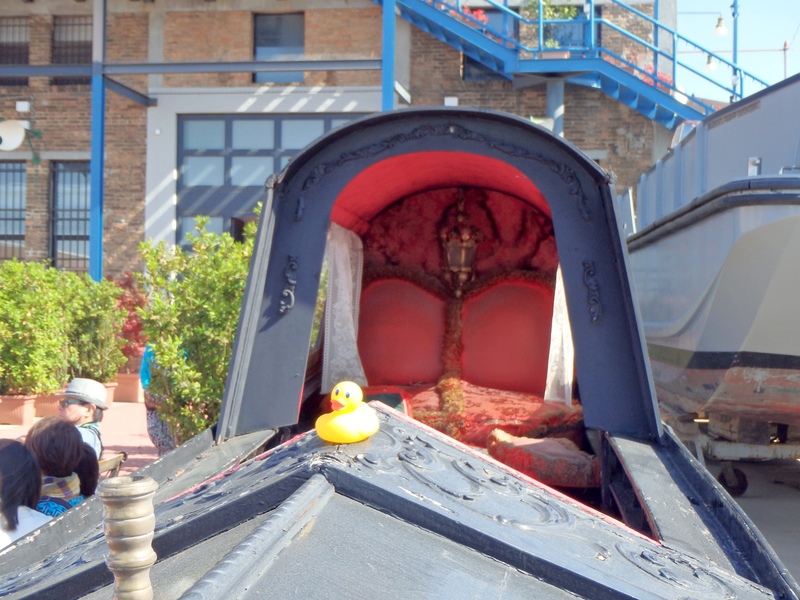 While in London, Ms. Ducky and her humans visit many of the famous places. They even saw the Royal Jewels. 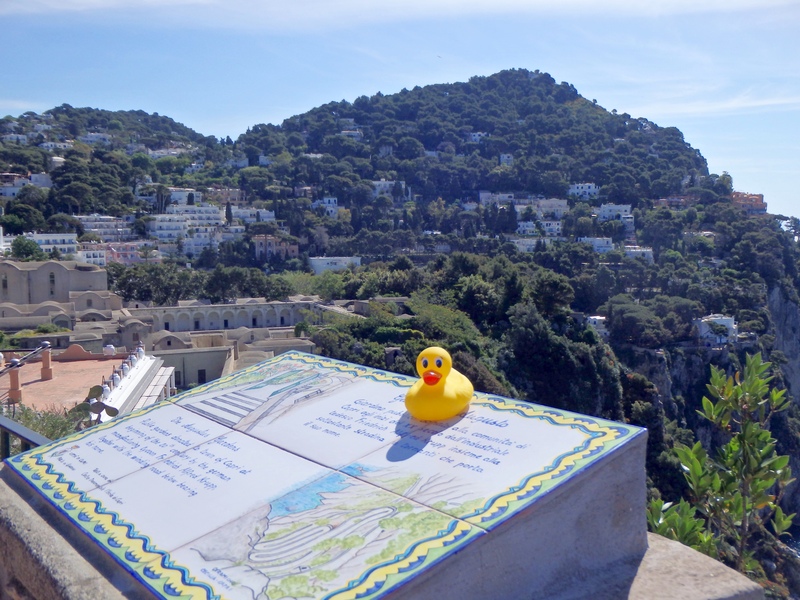 Many places she loved but she told me it was difficult to get photos of places and Ms. Ducky. 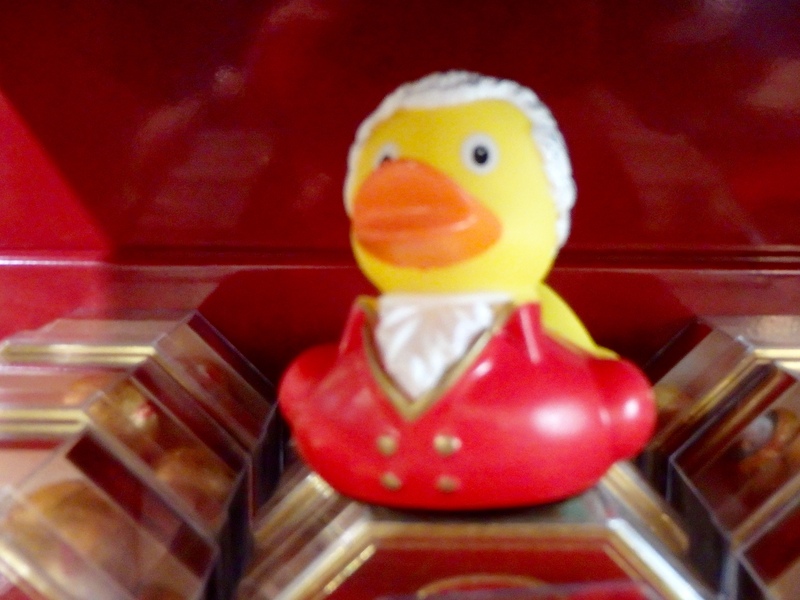 So this is about Ms. Ducky, not just Europe. 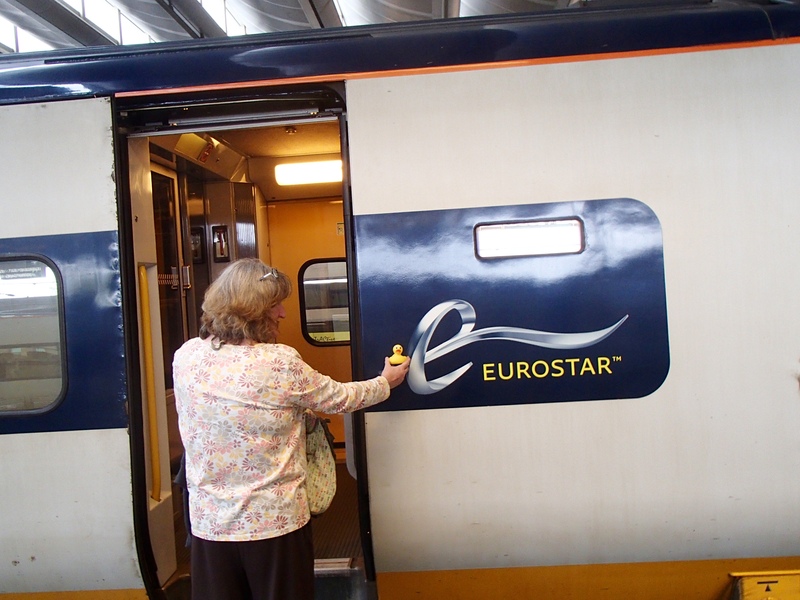 Next she and her humans boarded the Eurostar Train heading for Brussels, Belgium. 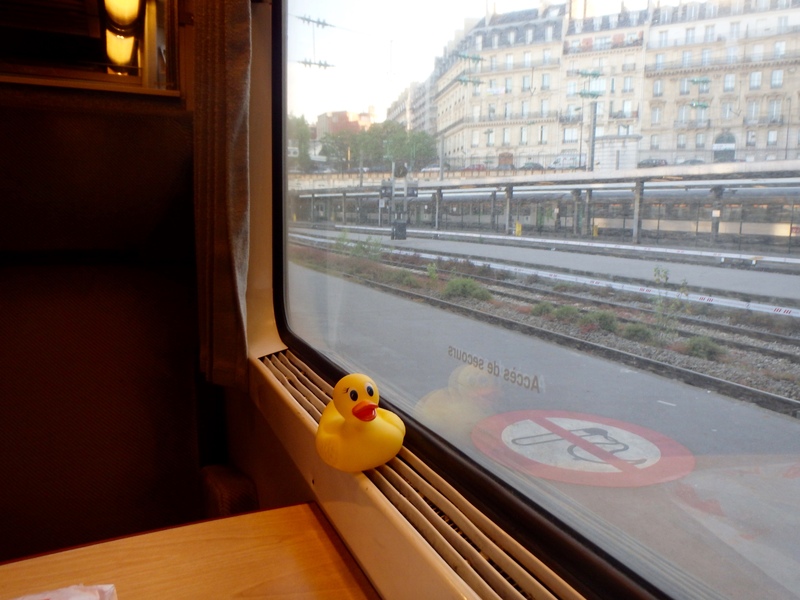 The train ride was fun, but shortly after their arrival, Ms. Ducky’s mom fell. And she fell hard. They they rode in the ambulance, sirens blaring and paramedics helping her mom. It was very scary and also very exciting. 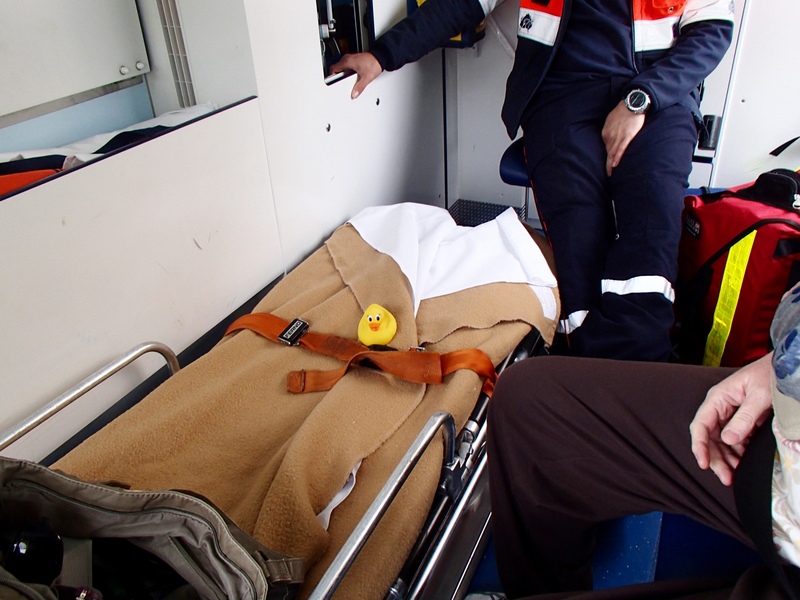 She sat on the stretcher after her mom was allowed to sit up. 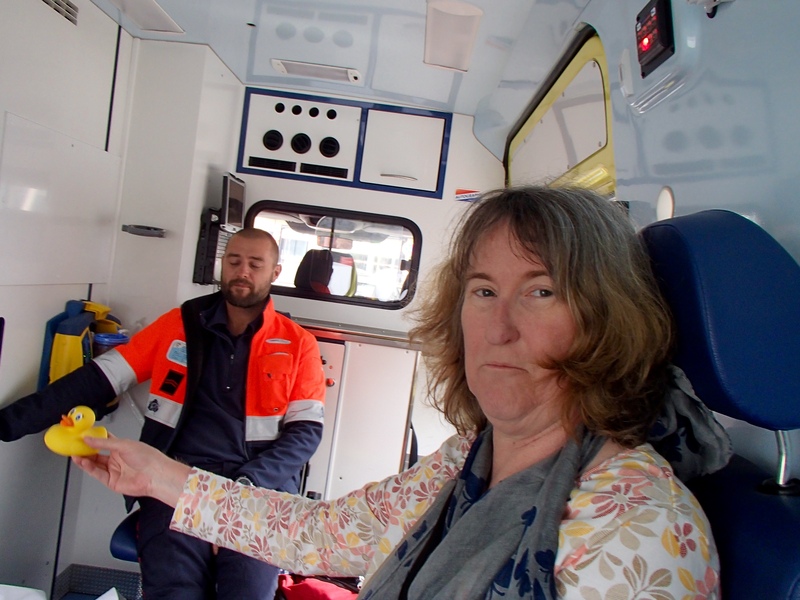 This paramedic is her friend. He helped her mom. 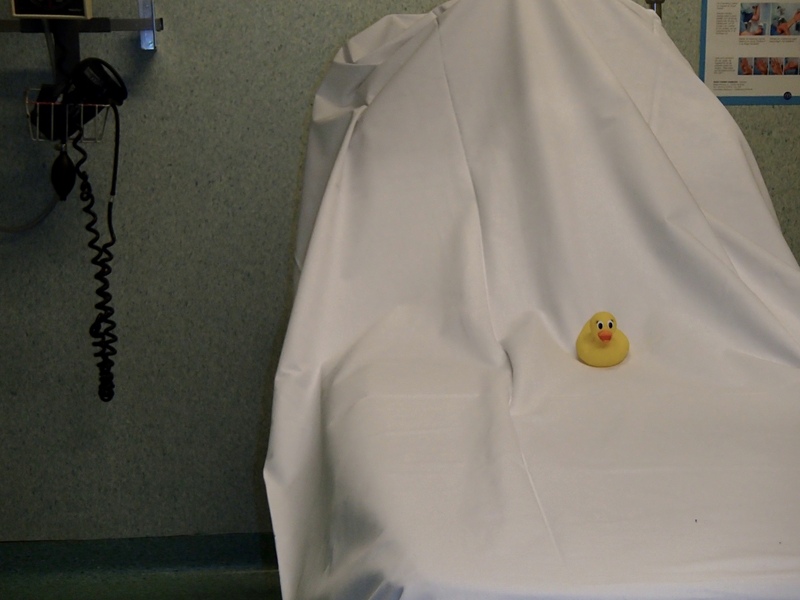 When they arrived at the hospital and after they said her mom could leave the hospital, Ms. Ducky relaxed for a moment on a bed in the emergency room. They then went to Holland. 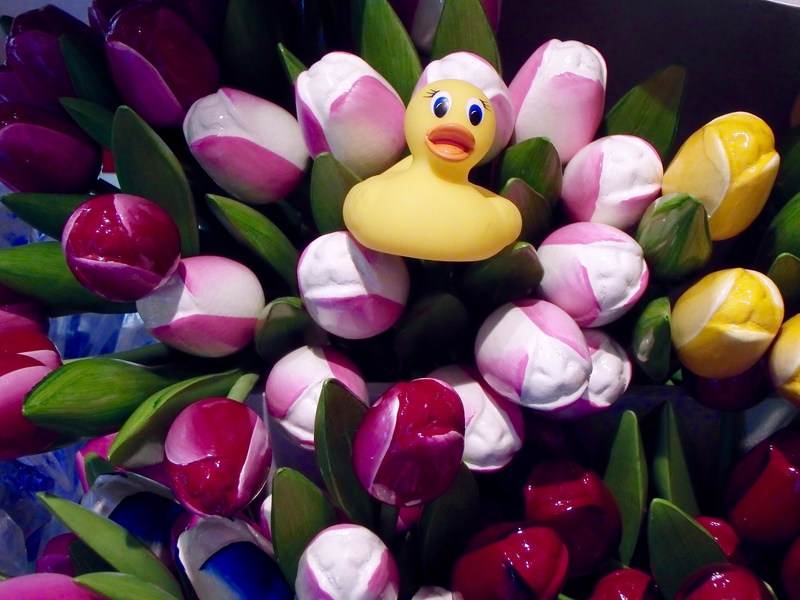 You know Holland–they are famous for tulips. Beautiful tulips! 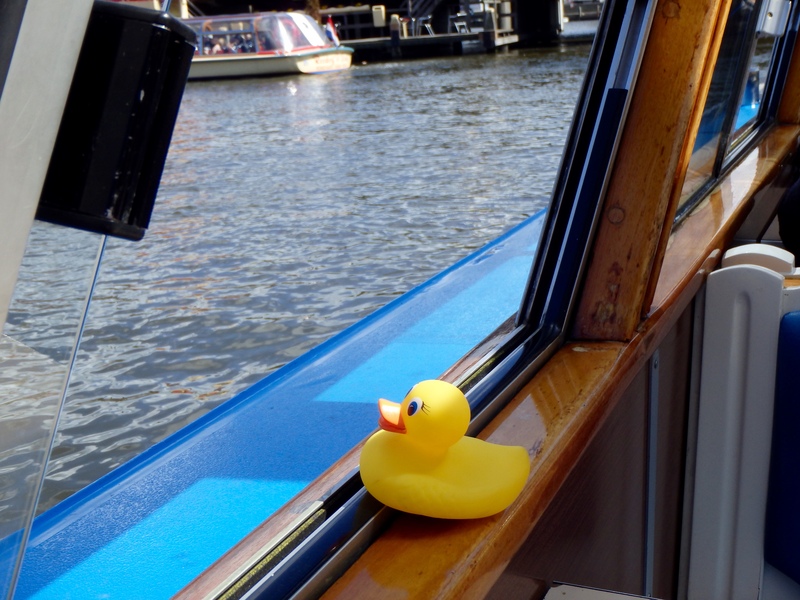 Here is Ms. Ducky touring the canals of Amsterdam. 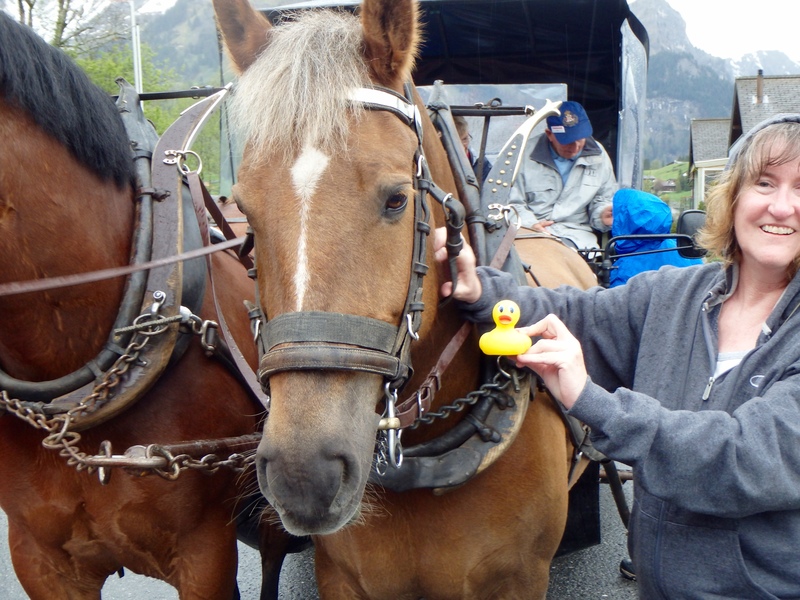 Ms. Ducky is a very friendly duck. 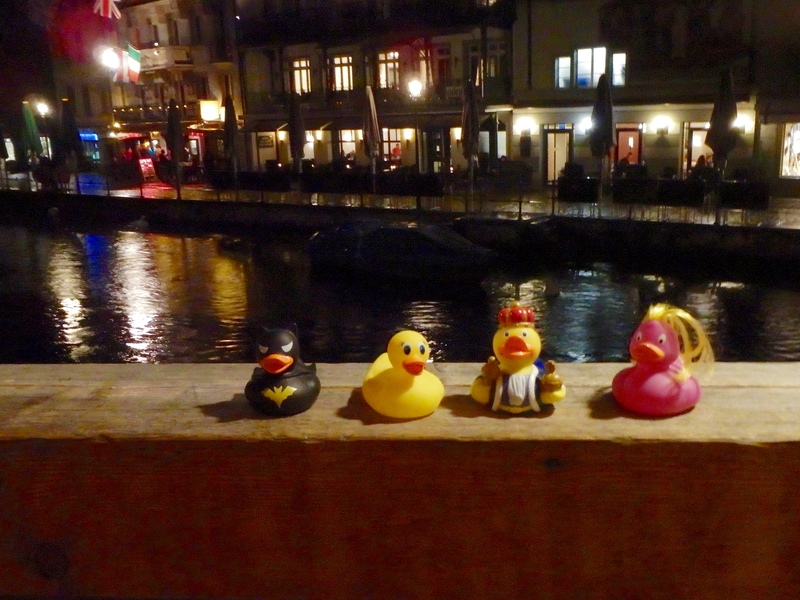 Here she is with new friends, enjoying the canals in the evening. 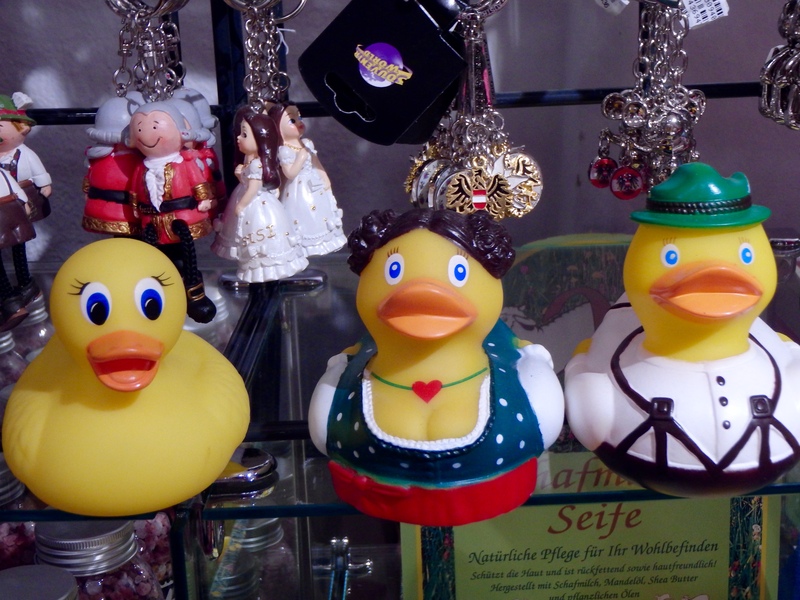 Ms. Ducky and friends. Evening on canal in Amsterdam. Be careful there! 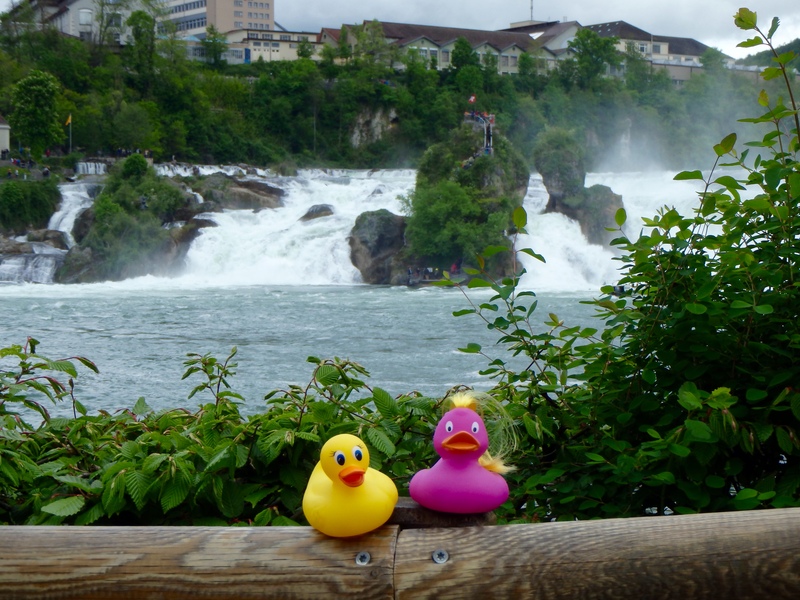 Now Ms. Ducky and her friend from Holland are visiting Rhine Falls. Wow! Really beautiful. Thanks for sharing with us, Ms. Ducky. We look forward to more about your trip to Europe.